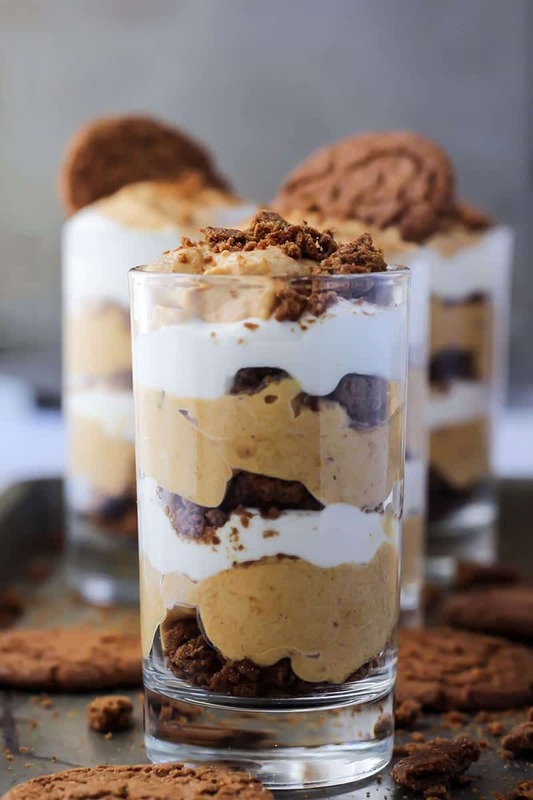 Healthy Pumpkin Mousse Parfaits! 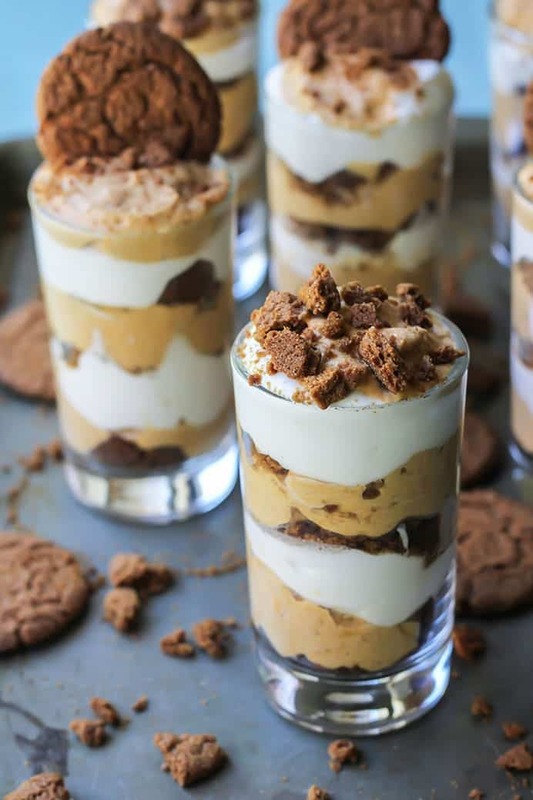 Individual desserts all ready to devour with layers of pumpkin mousse, whipped coconut cream, and crushed gingersnap cookies. A dairy-free and paleo-friendly dessert! This post is sponsored by my partnership with Vital Proteins. All opinions expressed, as always, are my own. Thank you for your continued support and allowing me to partner with brands I trust, making Fit Mitten Kitchen possible! But ’tis the season for getting festive so we’re making pumpkin mousse! This version just so happens to be paleo-friendly, using whipped coconut cream and grass-fed gelatin from Vital Proteins. Making your own pudding or mousse at home is actually really easy! No to mention you avoid all of the unnecessary ingredients found in store-bought packages. (Seriously, just read the package next time and it’s mind-boggling how those ingredients even produce something semi-edible. It’s basically sugar and modified cornstarch… YIKES.) And you’re using gelatin from pasture-raised grass-fed beef. Vital Proteins takes great measures to ensure their collagen is the highest quality, so you can feel good knowing their products are ethically sourced. -You’ll first allow the gelatin to sit in the water to soften. While that sits you can combine the pumpkin, eggs, sugar and spices. -Then you’ll heat up the bowl of gelatin-water over a pot of simmering water until the gelatin is clear. While the gelatin is cooking down you can whip the chilled coconut cream. 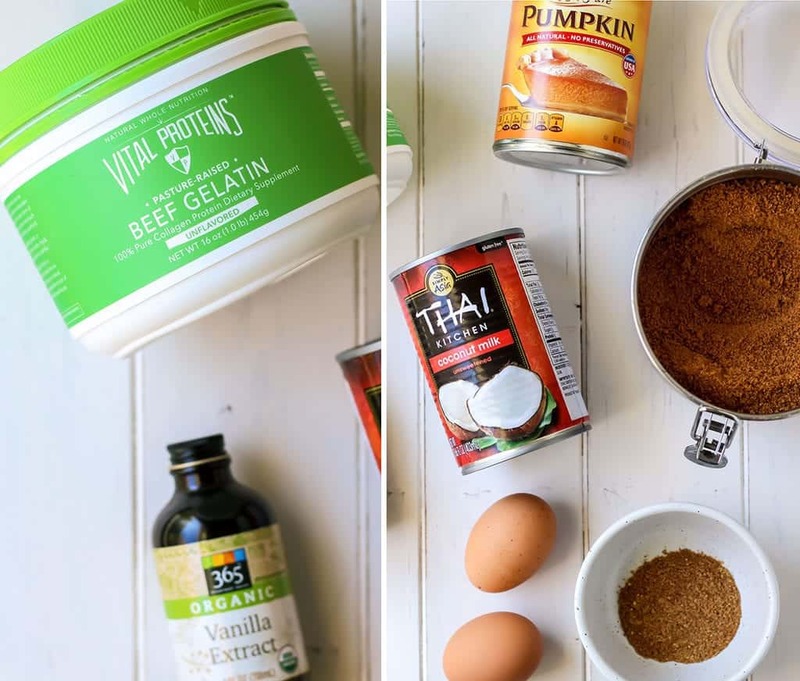 -Once the gelatin is clear you will quickly whisk it into the pumpkin mixture–the hot gelatin cooks the eggs, so no worries there. Then you fold in the whipped coconut cream. All that’s left is to let the pumpkin mousse chill covered in the fridge for about 4-6 hours (or overnight). 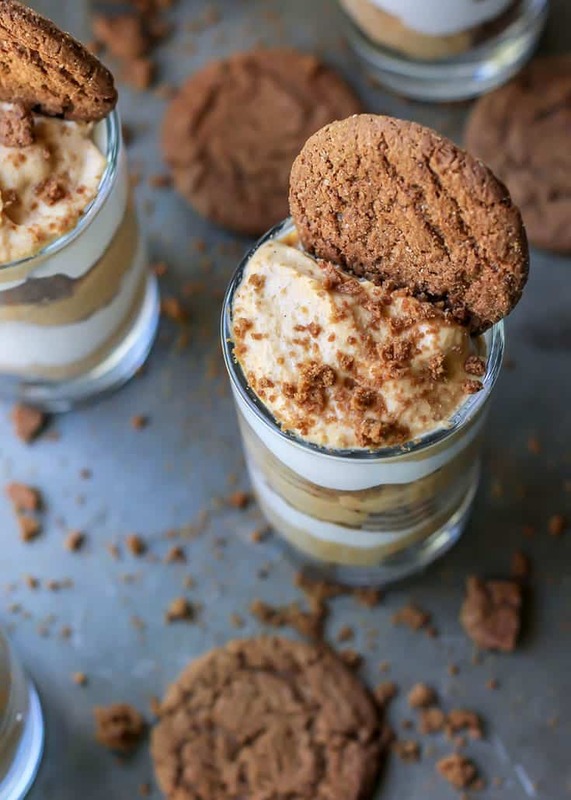 When you’re ready to assemble the parfaits you’ll layer in crushed gingersnap cookies, pumpkin mousse, whipped cream, and repeat! 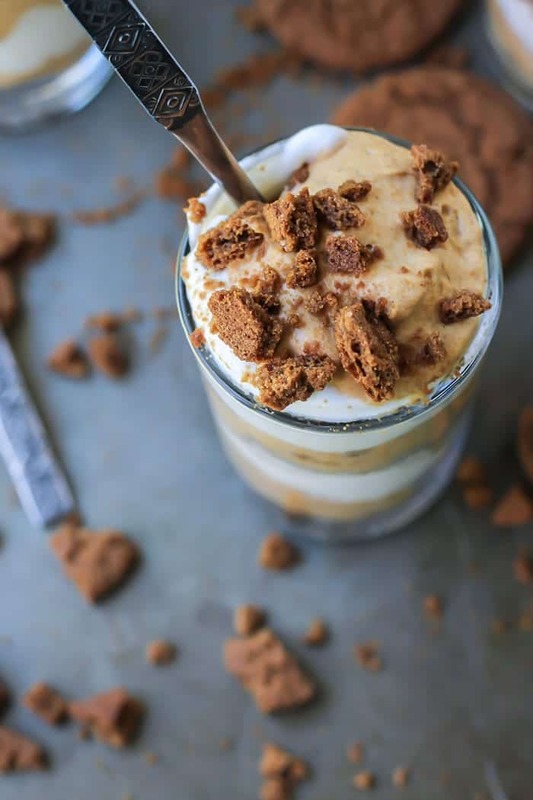 This pumpkin mousse dessert is the perfect dairy-free and gluten-free friendly option to share with friends and family during the holidays. 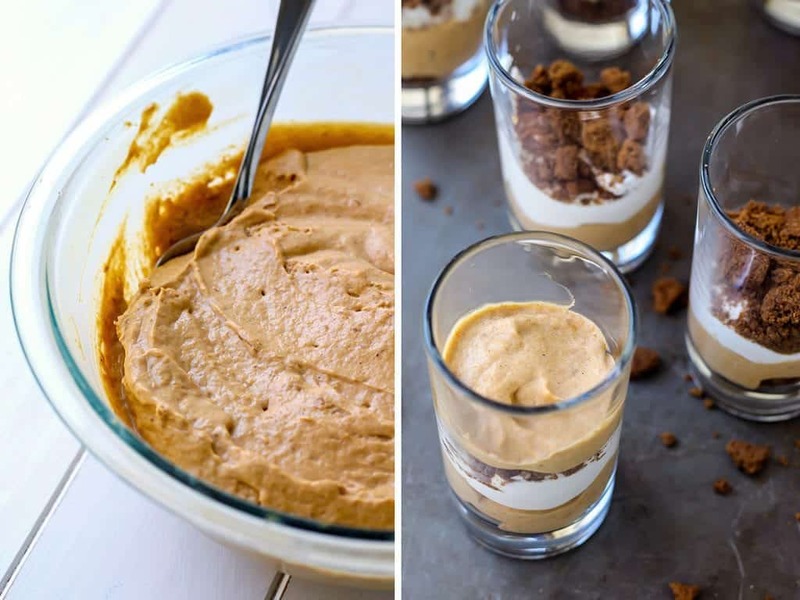 The pumpkin mousse itself is completely paleo-friendly (grain-free, dairy-free, soy-free). 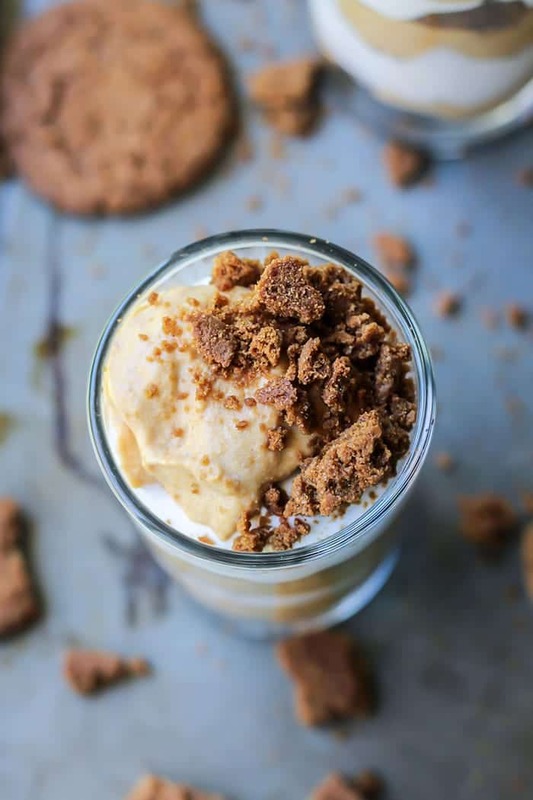 If you’re looking for a homemade paleo-friendly gingersnap recipe to go with these pumpkin mousse parfaits, I recommend checking out this one from Food Faith Fitness. Add 1/4 cup water to heat-proof bowl, then sprinkle the 2 teaspoons gelatin over water and allow to soften for 10 minutes. In a large bowl, whisk together the pumpkin, eggs, sucanat, coconut sugar, cinnamon, nutmeg, ginger, and salt. Set aside. Place the heat-proof bowl of gelatin-water over simmering pot of water, cook until the gelatin is clear. While the gelatin is cooking over the pot, make the whipped coconut cream: Scoop out the cream portion of the all 3 cans of coconut milk (save the water for smoothies, shakes, etc) and place cream in the bowl of a stand mixer. Using the whisk attachment, whip the chilled coconut cream and vanilla extract together until thick and fluffy. Set aside. Once the gelatin has cooked until clear, whisk immediately into large bowl of pumpkin mixture. Then fold in 2 cups of the whipped coconut cream–saving the rest for parfait layering. Place covered bowl of pumpkin mousse mixture in fridge and allow to chill 4-6 hours, or overnight. 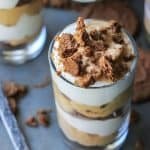 To assemble parfaits: layer crushed gingersnap cookies, pumpkin mousse, and whipped coconut cream, repeat until glass is full. Garnish with gingersnap cookies, and more whipped cream if desired. Enjoy! *regular granulated sugar may be subbed, or you may use all coconut sugar. So Delicious does make a store-bought frozen coconut whipped topping if you’d rather not whip your own coconut cream. If not dairy-free, you can also use heavy whipping cream (about 2 cups total). 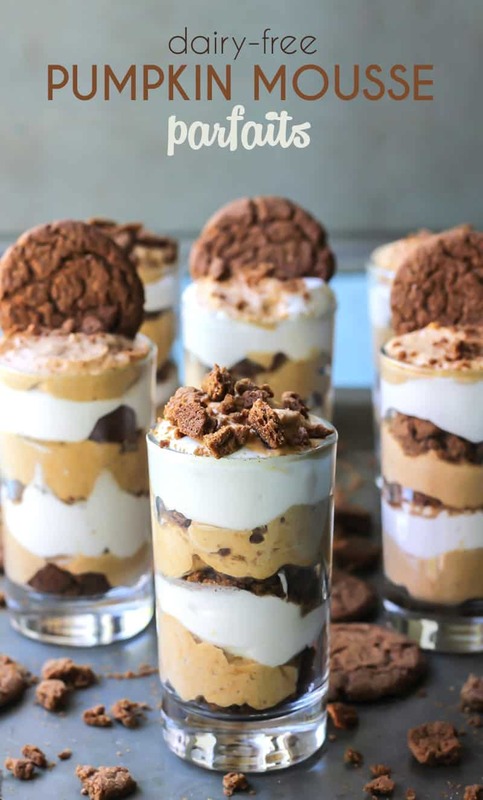 –Parfaits can be assembled, covered and refrigerated the night before, add garnishes before serving. 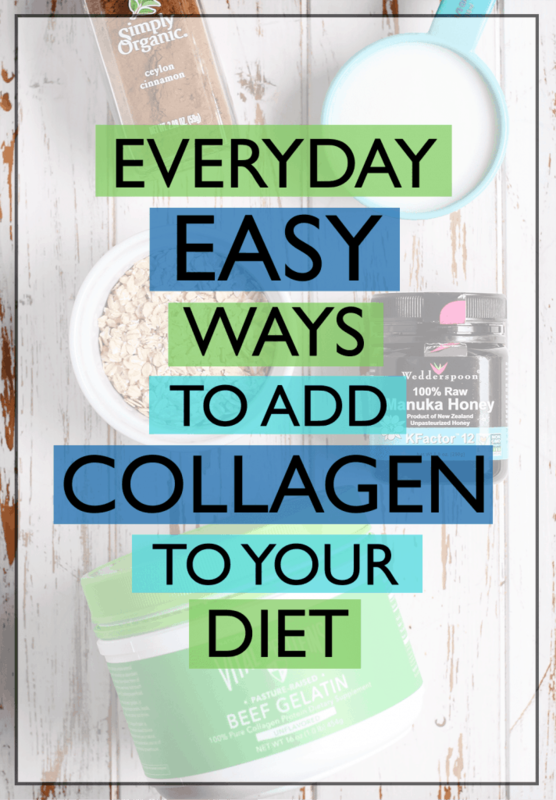 Looking for more ways to use collagen? These are so cute! I’d rather have these than pumpkin pie any day! Ooh wow, the mousse looks SO creamy. I could be all over this. Wow, I’m thinking I might like this more than pumpkin pie too. These look delicious and I’d go for one of these over pumpkin pie any day (I’m not a huge pie person). I’m a huge (HUGE) fan of pumpkin, but these have even me questioning if I should test these out for Thanksgiving. Paired with the gingersnaps sounds perfect! I know this wouldn’t make it paleo friendly, but could I substitute cool whip for the coconut cream? I love texture of pudding too! And I should def have this over pumpkin pie. I really only like pumpkin pie if the crust is homemade, if not I’ll most likely just eat the filling. And snack packs were some of my favs growing up!